Knock Out Dog Fighting // We Need Your Help! When Michael Vick was arrested for dog fighting the American public was given a glimpse of the sadistic world of dog fighting and they outraged. They learned that dog fighters not only force these animals to fight to the death, many also engage in violence against the dogs by means of electrocution, strangulation, kicking, drowning and other unimaginable acts of cruelty. Help us prevent more animals from suffering untold horrors at the hands of dog fighters through our innovatice youth programs by clicking on the donate button below to make your tax deductible donation. Just Condemning Dog Fighting Doesn't Stop Dog Fighting....You Need To Do Something! Yes! 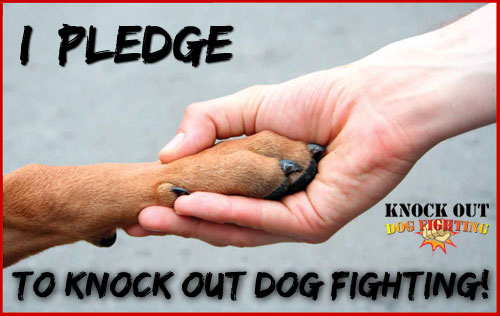 I want to help Knock Out Dog Fighting! It's Time We Fight For Them! We are a volunteer run non profit 501(c)3 organization program so donations are what keep this program running. The Knock Out Dog Fighting program is supported entirely by our own personal contributions and donations from the general public. As such, we rely heavily on the generosity and kindness of friends like you. One hundred percent of your donation goes to support this anti-dog fighting campaign.